I was at AirAsia Bhd’s annual general meeting(AGM) this morning. 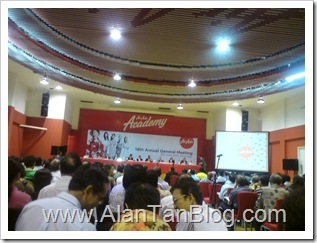 The AGM was held at AirAsia Academy hall located outside the capital Kuala Lumpur. The AGM begin with AirAsia founder, Tony Fernandes giving out the company presentation briefing to the shareholders. This AGM is very special to Fernandes who has been synonymous with AirAsia Malaysia. He has hand over responsibility for managing AirAsia’s Malaysia-based operation to Aireen Omar, former regional head of corporate finance, treasury and investor relations, who will act as the chief executive of the Malaysian operations. Tony Fernandes will then focus on regional growth through Indonesia and oversee the budget carrier’s regional expansion. According to the Chairman, 38-year old Ms Aireen, is still single and joking ask any eligible bachelor available in the meeting hall. Aireen’s brother, Ahmad Izham, is the CEO of TV3. As at today, AirAsia’s command 60 per cent share of the domestic Malaysian market and 40 per cent share of its international market. One of the new CEO priority will be maintaining the carrier’s market leadership and costs, as well as preparing for 2015 when Asean implements an open skies policy. As a token of appreciation, all shareholders who attended the AGM will get a free air ticket. AirAsia will send a letter to the shareholders mailing address and claim that ticket at any AirAsia counter. Tony Fernandes has make it very clear that beginning next year only shareholder(not proxy) who attend the AGM will get the free air ticket(or any token). The minimum holding must be in 1,000 shares. This is not good moves as some trading account is held under nominees. Therefore, you only can attend the AGM as a proxy even you own the shares 100%. Annual General Meeting of AirAsia Berhad is normally held at AirAsia Academy, Lot PT25B, Jalan KLIA S5, Southern Support Zone, Kuala Lumpur International Airport, 64000 Sepang, Selangor Darul Ehsan, Malaysia. There have a big signage leading to AirAsia Academy. How To Go To AirAsia Academy? Just follow the sign board to LCCT. 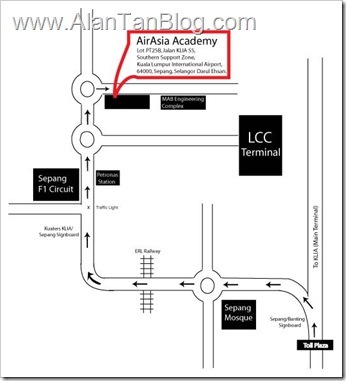 If you go to LCCT, AirAsia Academy is on your left. This entry was posted on Thursday, June 21st, 2012 at 11:14 pm	and is filed under stock market. You can follow any responses to this entry through the RSS 2.0 feed. Both comments and pings are currently closed.